Arts for Learning (A4L) is a nationally designed and scientifically tested series of “Lesson Units”—classroom-ready materials and references that target crucial points in the language arts curriculum. 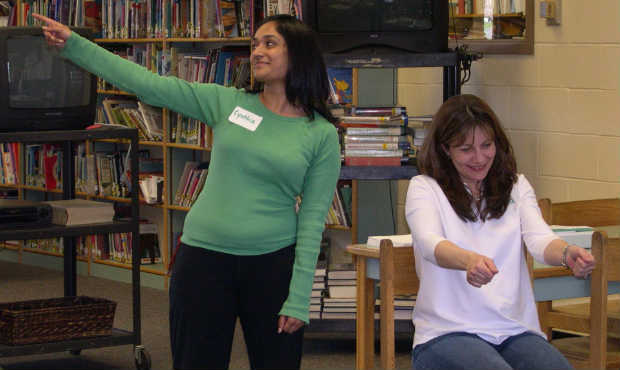 Dance, music, theater, and visual arts help students learn by making abstract literacy concepts concrete through the use of images, sounds, movement, language, body, and voice. Skills reinforced through the curriculum include understanding character perspective, making inferences, summarizing, synthesizing information, making predictions, and determining importance. After a three-hour Arts for Learning training, teachers will be ready to implement a unit of study with their students. Call or visit our website to learn more about Arts for Learning. Design Your Own Course: Providing the tools teachers need to substantively change their practice can take more than a one-day workshop. Call us about designing your own course for optimum success. We can pair professional development with an artist-in-residence and provide the modeling, reflection, practice, and support needed to truly infuse the arts into your school’s curriculum. Call for pricing.